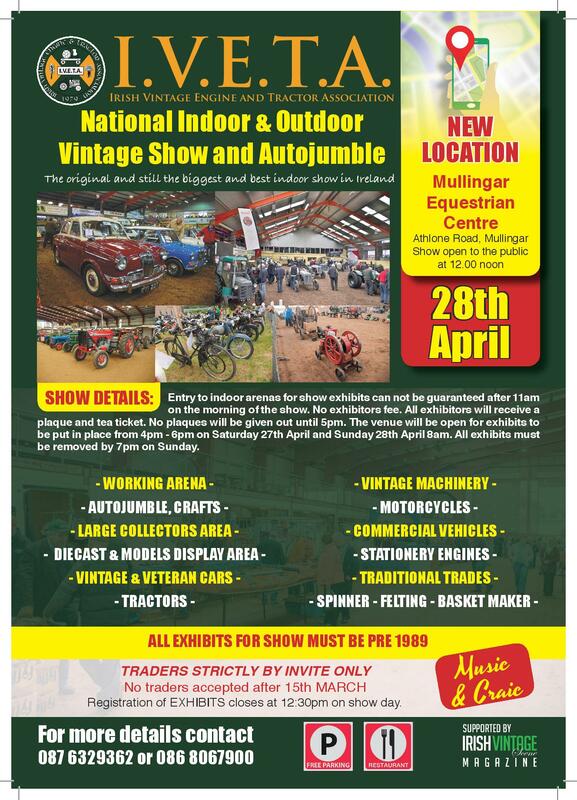 THE massive I.V.E.T.A Irish Vintage engine and tractor association national indoor and outdoor vintage show takes place Sunday 28th April in Mullingar Equestrian Centre at 12 noon. Displays include some of the oldest and rarest cars and tractors, crafts, live music and lots more. “Sunday 28th April will see vintage enthusiasts from all over Ireland heading to Mullingar Equestrian Centre for the national Irish Vintage Engine Tractor Association (IVETA) indoor and outdoor vintage show and autojumble .There will be something for everyone from vintage cars, tractors, stationary engines and commercial vehicles to traditional basket-making, music and children’s entertainment. The show, which is widely regarded as the biggest and best show of its kind in Ireland, has been running since 2002 in Cavan but this year sees it moving to a new home with a better location and extra outdoor facilities and parking than in previous years. The IVETA is celebrating its 40th anniversary this year and with over 8500 members, it is the largest vintage organization in Europe.